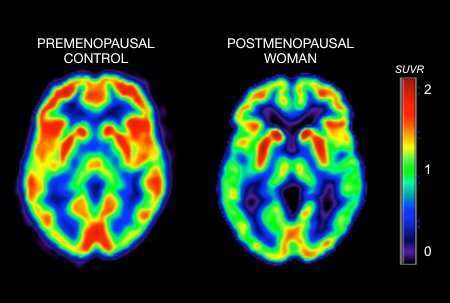 Menopause causes metabolic changes in the brain that may increase the risk of Alzheimer's disease, a team from Weill Cornell Medicine and the University of Arizona Health Sciences has shown in new research. The findings, published today in PLoS One, could help solve a longstanding mystery about Alzheimer's, namely, why women get this fatal neurodegenerative disorder more often than men—even accounting for the fact that women on average live longer. The investigators say the results also eventually may lead to the development of screening tests and early interventions to reverse or slow the observed metabolic changes. Alzheimer's afflicts more than 5 million Americans, including one-third of Americans older than 85, and the disease process is known to begin several decades before dementia sets in. "This study suggests there may be a critical window of opportunity, when women are in their 40s and 50s, to detect metabolic signs of higher Alzheimer's risk and apply strategies to reduce that risk," said lead author Dr. Lisa Mosconi, who was recruited to Weill Cornell Medicine as an associate professor of neuroscience in neurology. The tests revealed the women who had undergone menopause or were peri-menopausal had markedly lower levels of glucose metabolism in several key brain regions than those who were pre-menopausal. Scientists in prior studies have seen a similar pattern of "hypometabolism" in the brains of patients in the earliest stages of Alzheimer's—and even in mice that model the disease. "Our findings show that the loss of estrogen in menopause doesn't just diminish fertility," said Dr. Mosconi, associate director of the Alzheimer's Prevention Clinic at Weill Cornell Medicine and NewYork-Presbyterian. "It also means the loss of a key neuroprotective element in the female brain and a higher vulnerability to brain aging and Alzheimer's disease. We urgently need to address these problems because, currently, 850 million women worldwide are entering or have entered menopause. Our studies demonstrate that women need medical attention in their 40s, well in advance of any endocrine or neurological symptoms." The findings add to mounting evidence that there is physiological connection between menopause and Alzheimer's. Dr. Mosconi and colleagues published a study in Neurology in September that linked menopause to increased accumulation of the Alzheimer's-associated protein amyloid beta in the brain. The investigators also observed reduced volumes of gray matter (brain cells) and white matter (nerve fiber bundles) in brain regions that are strongly affected in Alzheimer's. More specifically, the authors suggest that the menopausal fall in estrogen may trigger a shift to a "starvation reaction" in brain cells—a metabolic state that is beneficial in the short term but can be harmful in the long term. "Our work indicates that women may need antioxidants to protect their brain activity and mitochondria in combination with strategies to maintain estrogen levels," Dr. Mosconi said, noting that exercise and foods that are rich in antioxidants, such as flaxseeds, also may help boost estrogen production. "We believe that more research is needed to test efficacy and safety of hormonal-replacement therapies at the very early stages of menopause, and to correlate hormonal changes with risk of Alzheimer's. This is a major priority at our Alzheimer's Prevention Clinic." "We really need to follow larger groups of women over long periods to see how this menopausal change in metabolism relates to Alzheimer's," she said. Said Dr. Brinton, a leading neuroscientist in the field of Alzheimer's, the aging female brain and regenerative therapeutics: "Outcomes of this study will provide critical evidence for early changes in the aging female brain that are relevant to the two-fold greater lifetime risk in Alzheimer's disease. Importantly, these results indicate that we know when to intervene in the aging process to divert the potential for developing this devastating disease."